hey! it's halloween and the first official day of the postseason! one of those things means that kids will be ringing my doorbell looking for candy. 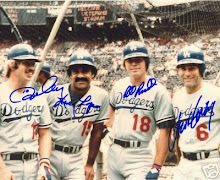 the other means that pretty soon, a bunch of men will be ringing ned colletti's doorbell looking for a taste of the dodger money stream. i don't think there will be too many kids dressed as green lantern this year (plenty of iron men though), but raul mondesi's 1996 score insert here made me think of hal jordan perhaps facing off against sinestro while mondy tried to figure out what base to throw to. it also reminds me that at around 9:30 tonight, there will be some high school aged kids using their baseball uniforms as costumes. nice try. hope you like raisins. 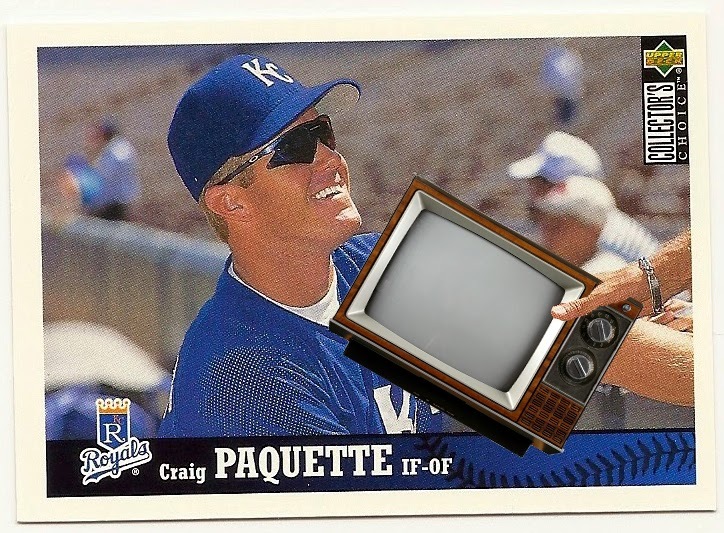 what does craig paquette have up his sleeve? some might think that craig paquette was the embodiment of the southern california dude back in 1996. it makes sense - he had his tan, his wraparound shades, his blond hair, and his pearly whites, but he also had something else. 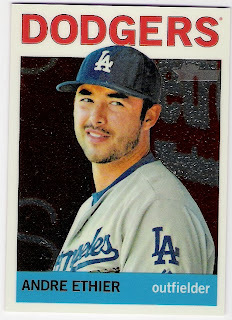 the socal native had a fan who would give him things to put up his sleeve before games. here, on paquette's 1997 upper deck collector's choice card, we are given a glimpse of the scene immediately following one such transaction. now, what could paquette be putting up his sleeve? and why? well, now, for the first time, we are able to understand thanks to recently discovered photo variations of the card. take a look. interesting. 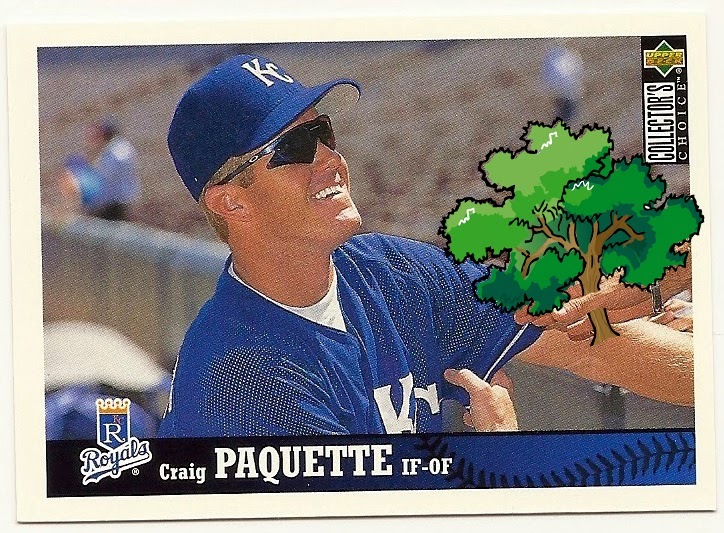 that looks like a tree. it's as if the unidentified fan is telling paquette to put a tree in his sleeve. that's weird. that's a transformer action figure - bumblebee, i believe. i guess i should know, but i was too busy looking at megan fox to really have understood what was going on in that movie. but yes, it is bumblebee. so, paquette has also put bumblebee in his sleeve. ok, now this is strange. a clock? and now some fleas? what would paquette have to gain by putting a bunch of chili pepper bassists in his sleeve? i wonder if the chili peps would make him start to sneeze in his sleeve. and that's a little tiny man, both put in paquette's sleeve. now a light? would that make it bright in his sleeve? who is this fan, anyway? it's the boogie. 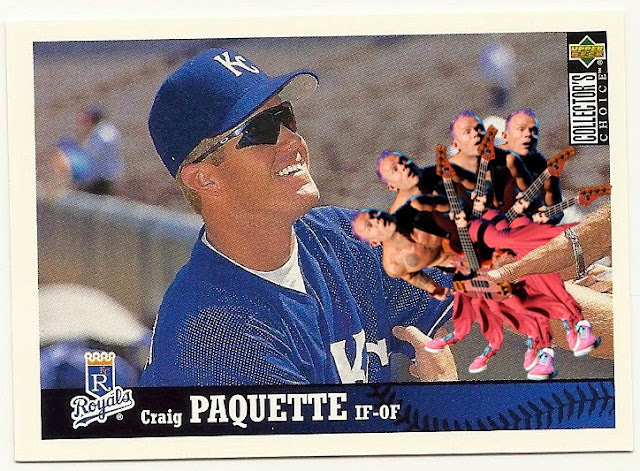 paquette's got the boogie in his sleeve. well, the boogie did paquette good in 1996, as he led the royals in home runs (22) and rbi (67). i would never have guessed that paquette had ever hit that many dingers, but when you've got the boogie, i suppose anything is possible. hooray for hollywood! 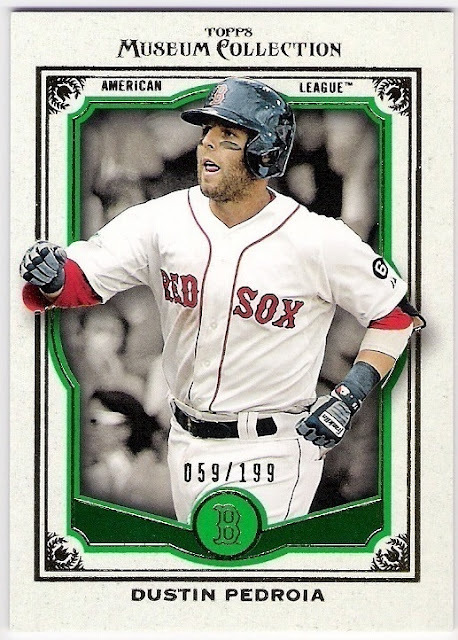 and triple threads, too, i suppose. today is the day - the day that topher at crackin' wax busts his case of 2013 topps triple threads. 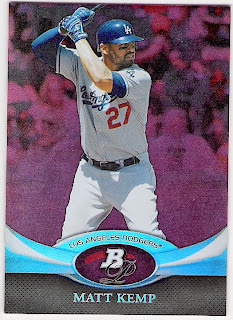 i took the dodgers, and i am hoping for some nice hits. 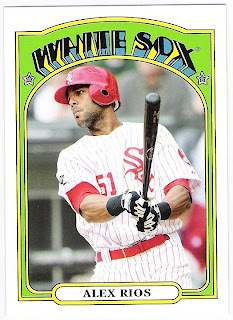 perhaps something along the lines of this 2011 topps triple threads card i recently acquired. 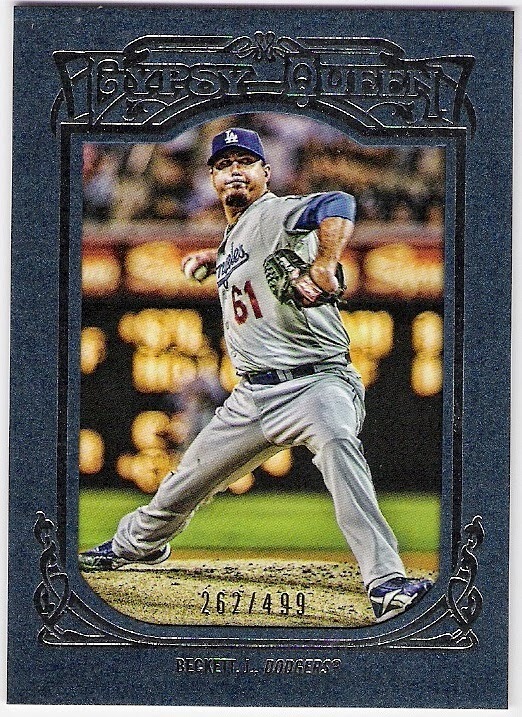 garvey seems a bit out of place on the card - gil hodges or pee wee reese might have made more sense - but i am in no way complaining. 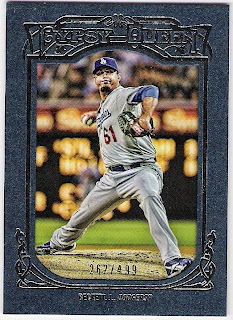 this is one of a few new-ish additions to my garvey collection which will slowly make their way to a post or several. 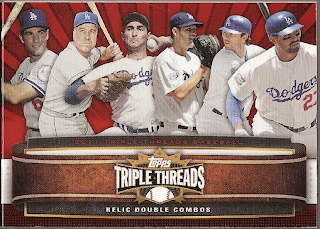 for now, i'm hoping to post some cool stuff from 2013 triple threads in the very near future! you've seen this one before. garvey was voted in as the starter of the 1985 all-star game - the 10th time in 12 seasons and the last time in his career that he received that honor - but topps put keith hernandez in the 1986 all-star subset. hernandez wasn't even on the roster for the game, and garvey was 1 for 3 with the game winning rbi, by the way. 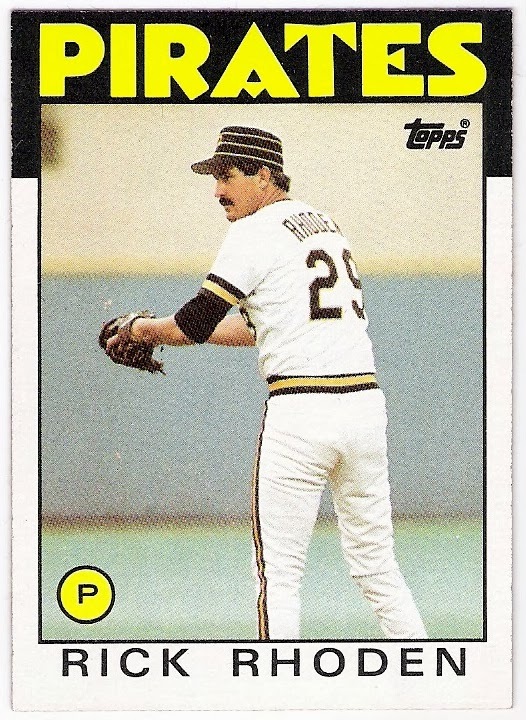 1985 also marked the last time that the all-star game was played in minnesota, although the twin cities will host the midsummer classic in 2014.
lopes was traded to the astros in july of 1986, but was left out of the annual traded set. with the 'stros, he was able to make his final postseason appearance. 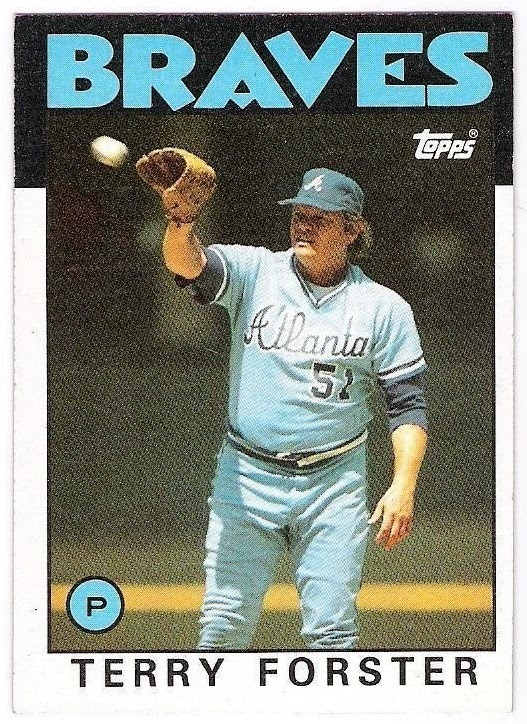 he made three pinch-hit appearances in the nlcs, including a 16th inning walk in game 6 off of jesse orosco. lopes came around to score the first of two astro runs in the inning, but the astros were unable to match the three runs the mets had scored in the top of the inning, and so lost the pennant to the eventual world champs. john signed with the yankees as a free agent at the start of the 1986 season, returning to the bronx for a second go-around. the 43-year old was left off of the topps traded checklist perhaps due to the fact that he didn't pitch for the yankees in april, july, or september. 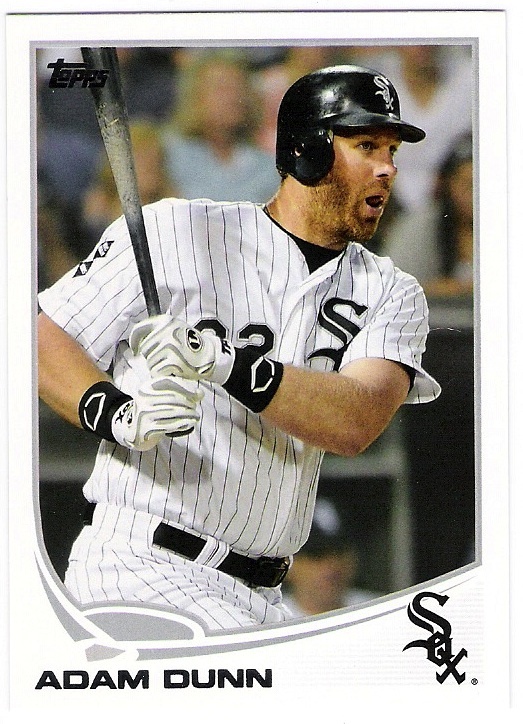 bill 'moose' skowron passed away in late april, 2012, and fellow white sox alum kevin hickey died a couple of weeks later. 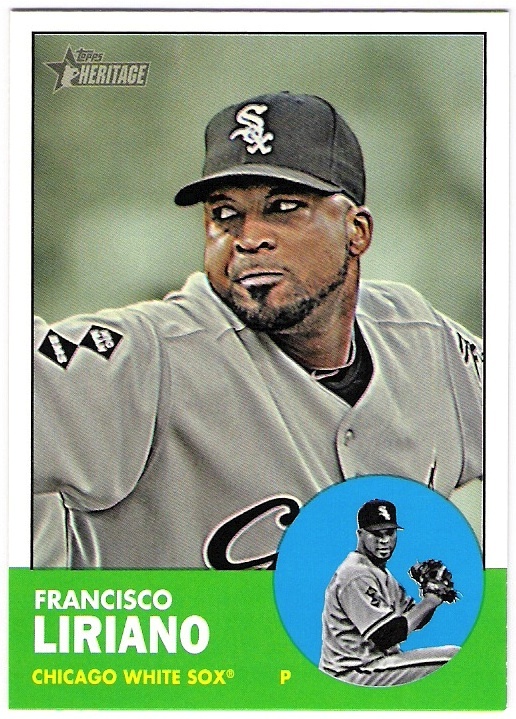 the white sox honored both former players with diamond memorial patches on their 2012 jerseys. the top one read 'hic man' for hickey, and the bottom patch had 'bms' for bill 'moose' skowron. 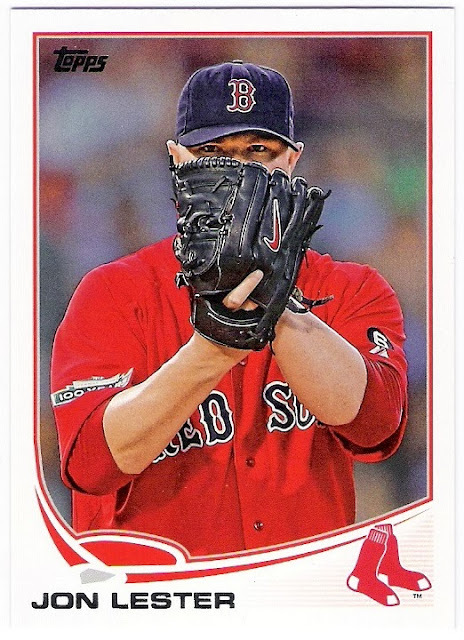 one thing i like about this relatively new collection of mine is that i get to learn about players that i might not have known much about otherwise. 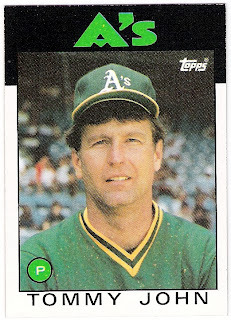 i did not know that kevin hickey's story rivals that of 'the rookie' jim morris or that philadelphia eagle player that disney made a movie about. 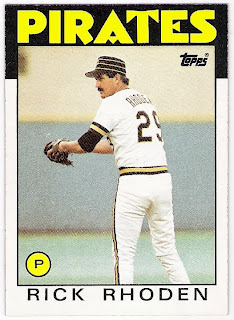 hickey was a steelworker who played softball and went to a tryout held by the white sox in the late 1970's. 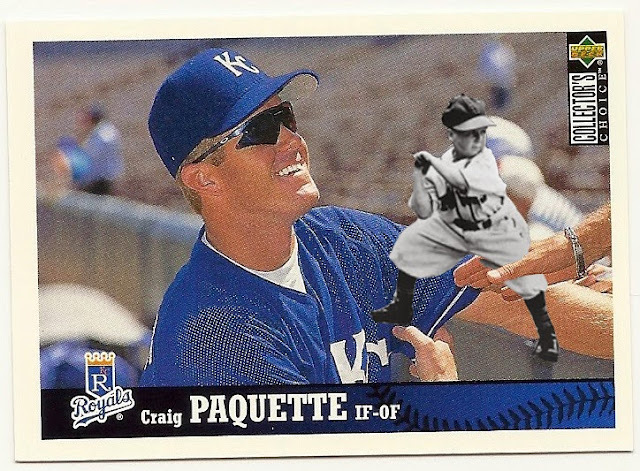 he did well enough that he wound up getting to play in the minor leagues. 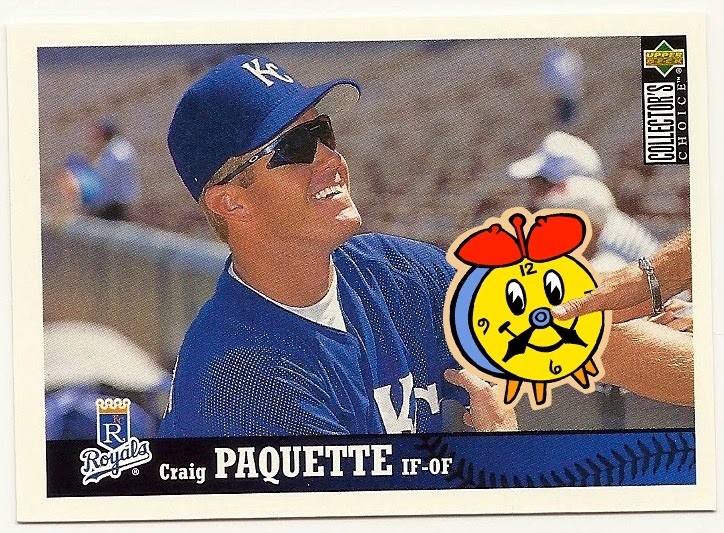 he eventually earned a call up and pitched in the majors for parts of six seasons - three with the white sox and three with the orioles. 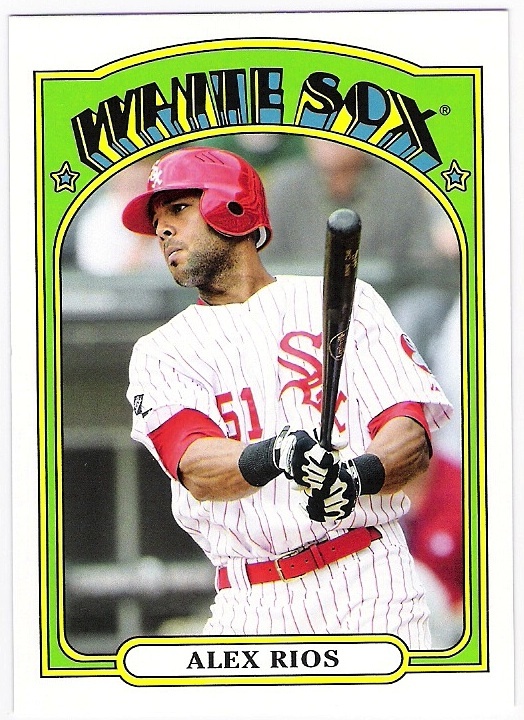 even after his playing career was over, he remained close to the white sox, and was the team's bp pitcher from 2004 up until his death. 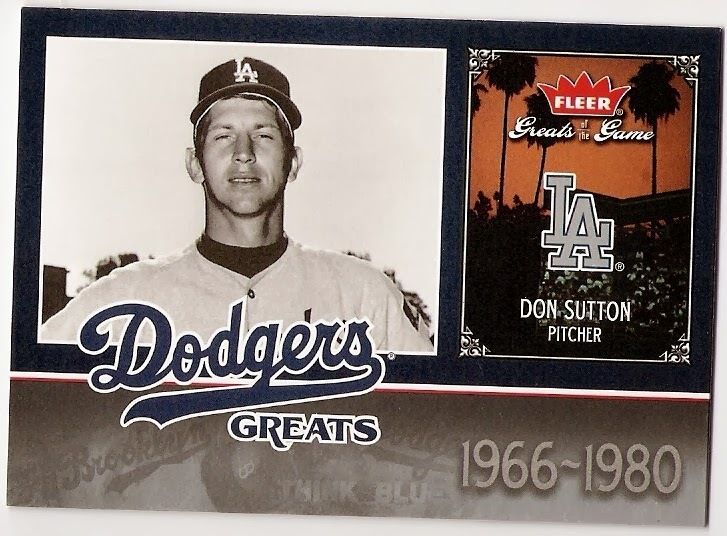 skowron i knew more about, largely because of his role in the dodgers' 1963 world series sweep of the yankees. 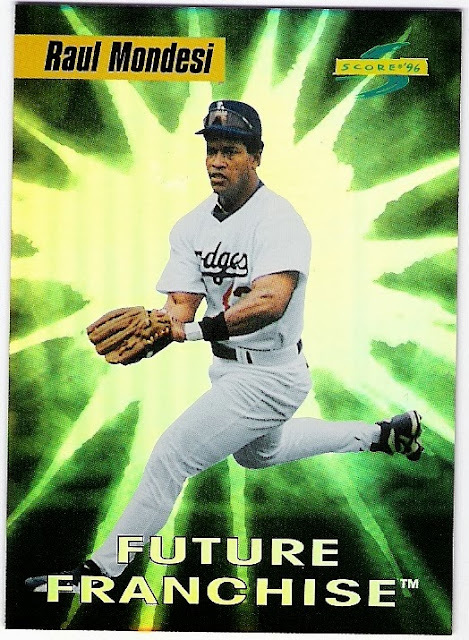 it was his lone season as a dodger, but he hit .385 in the fall classic with a home run to help defeat his former team, which he was not too thrilled about. beginning the following year (after a short stint with the senators), skowron played for the white sox for a few seasons. after retiring, he returned to chicago and served as an ambassador for the team as a member of their community relations department. skowron appeared in 7 world series as a member of the yankees to go along with his one as a dodger, but the yankees did not wear armbands in 2012.
in august of 2012, johnny pesky passed away at the age of 92. he had been a player, coach, manager, broadcaster and ambassador for the red sox over the span of 70 or so years, and was honored with a memorial patch and a black armband for the remainder of the season. while pesky was not affiliated in any way with the angels, it was a nice gesture on their part to honor a baseball lifer. in 2013, the angels would do the same with stan musial. pesky led the american league in hits in his first three seasons as a major leaguer; a streak that was interrupted due to service in the navy during world war 2. he may be best known by baseball fans as the person for whom fenway park's right field foul pole is named, but pesky put together quite a baseball career, and as bud selig said in a statement after pesky died, 'a great american life'. should i keep this card? so, i am wondering what other player collectors would do in this situation. i have a 2012 topps nolan ryan golden great card that i pulled from a pack. 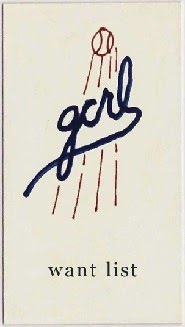 i am wondering whether to keep this card or not. sure, it's a nice card of a hall of fame pitcher wearing a colorful uniform. i did used to have a ryan pc, but that ended with most of my other pc's around 2002 or so. 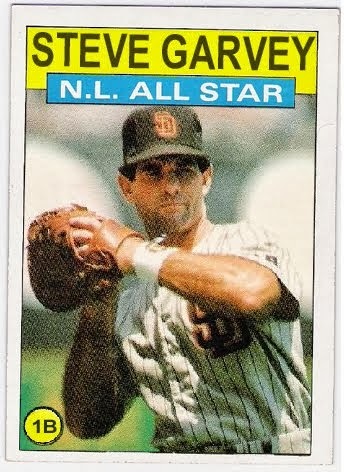 my main man steve garvey gets a mention on the back! even though it was the nlds (not the nlcs), garvey's home run was the only blemish on ryan's effort that day in '81. 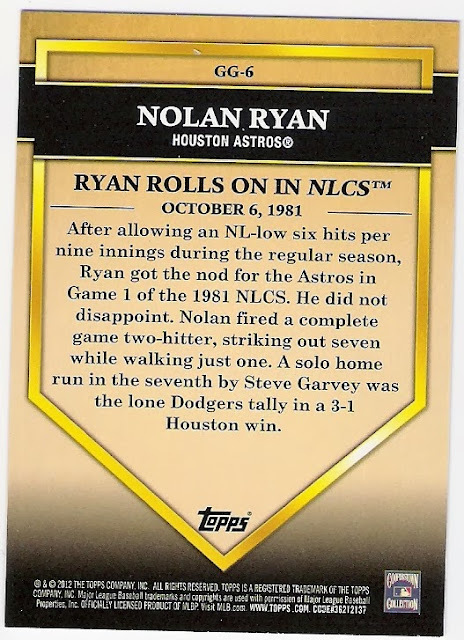 it's nice of topps to mention the garv, but i don't know that text on the back is enough to earn a spot in the garvey binder. i appreciate the inset photo of dodger stadium with the palm trees and the sunset. unfortunately, the 'dodgers' script seems to be a bit off. 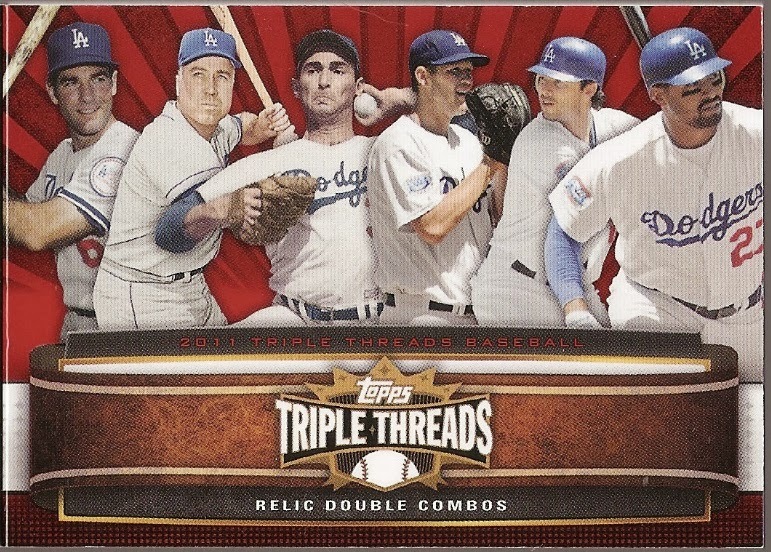 oh well, this is still a great insert set chock full of dodger greats. obviously. 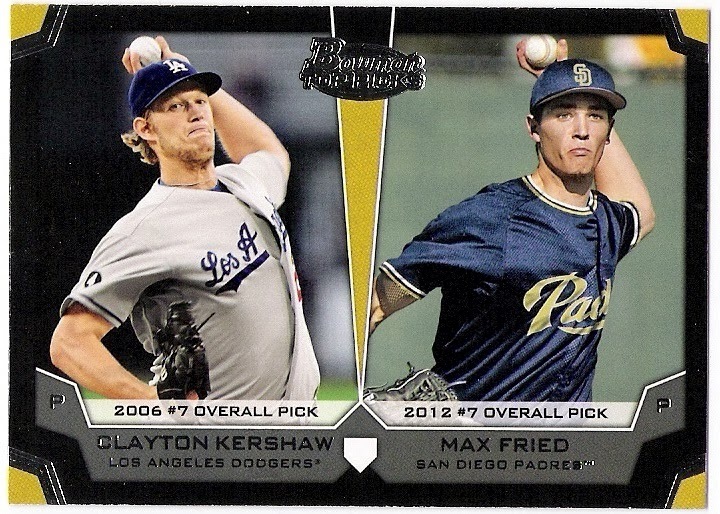 speaking of dodger greats, here is clayton kershaw on a 2012 bowman draft picks and prospects insert. 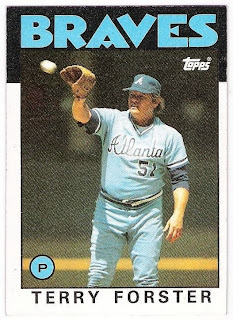 he shares space with a padres' southpaw, max fried, who was also a top ten draft pick. 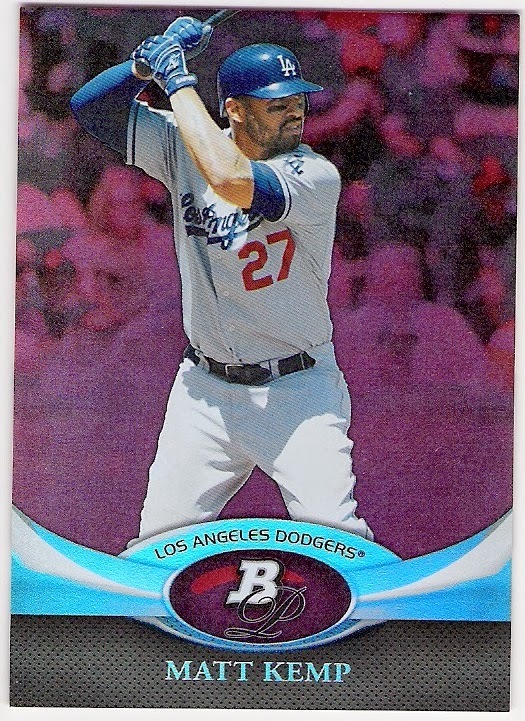 the dodgers will have beckett back in 2014 for one more season. 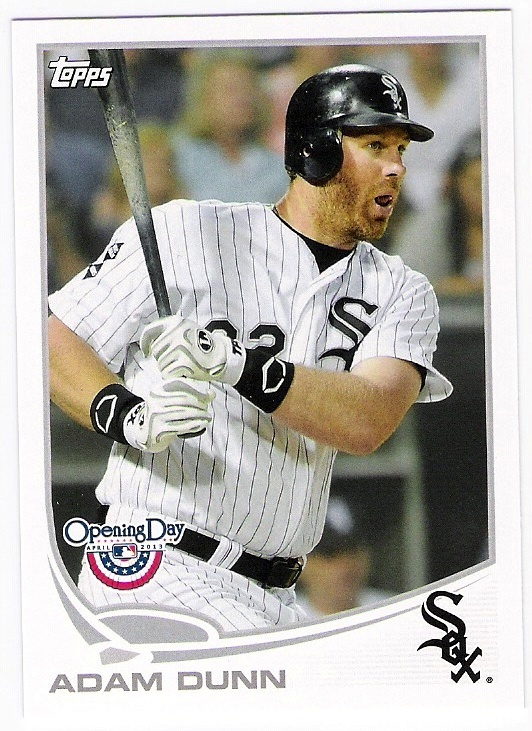 he was 0-5 in 2013 before his season was lost to injury. hopefully he will bounce back in a big way. 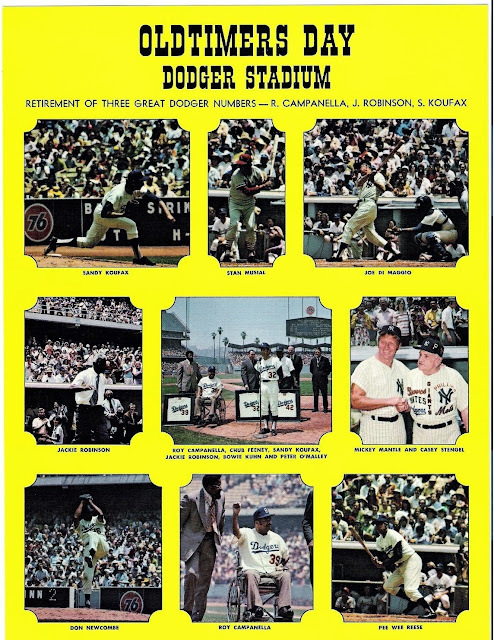 the most unusual (and unexpected) item in the package was a 8x10 giveaway sheet commemorating the 1972 oldtimers day at dodger stadium. 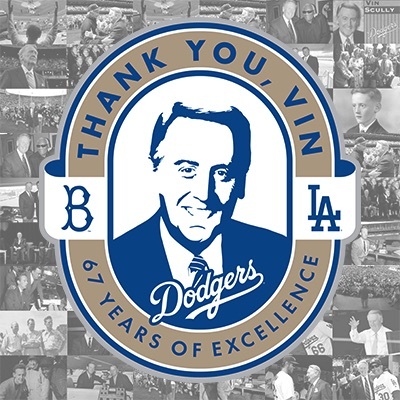 that was the day that the dodgers retired the jerseys of jackie robinson, roy campanella, and sandy koufax. it also marked, i believe, the last time jackie appeared in public, or at least at dodger stadium. he passed away in october of 1972, about four months after the ceremonies. 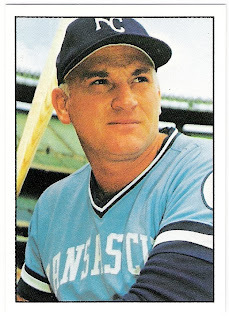 killebrew retired as the game's fifth leading home run hitter of all time, and no other right-handed american league player had hit more than his 573 homers at the time. 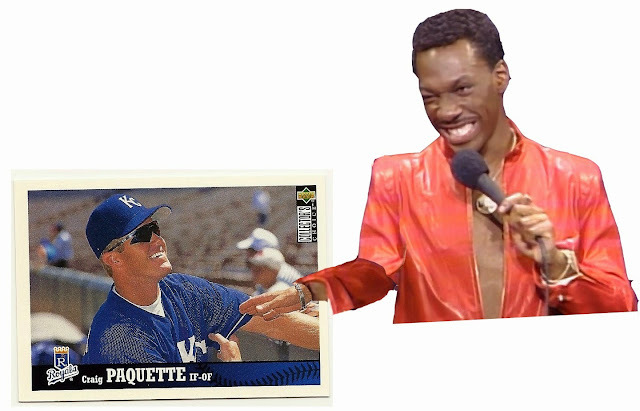 today, only alex rodriguez has surpassed him in that regard. it is fitting that the final home run of killebrew's career was hit during the last game he played in minnesota - a solo shot on september 18, 1975 at the metropolitan stadium. 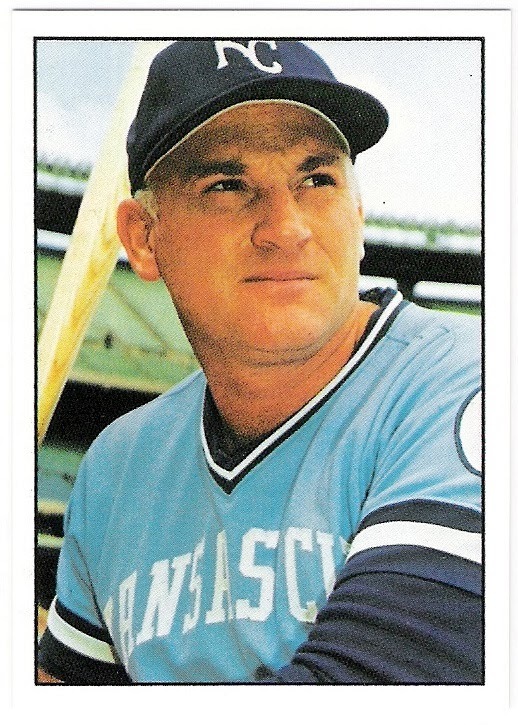 killebrew didn't want to leave the twins, but he also wanted to play, and calvin griffith was only willing to pay $50,000 for killebrew's services as a coach/pinch hitter in 1975. he ultimately was released and signed a 2-year deal with the royals. the twins retired his number during the 1975 season, and killebrew fittingly hit a home run in the game that featured the retirement ceremony. 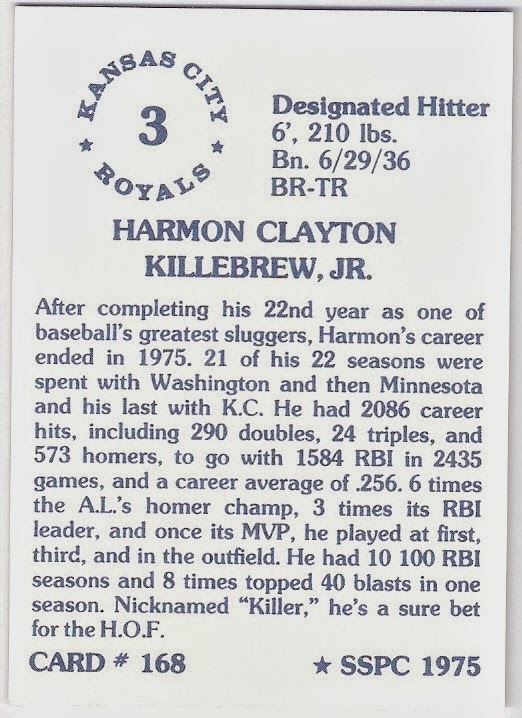 the royals, who finished second in the al west in 1975, released killebrew after the season ended, and he eventually returned to the twins organization and became one of its greatest ambassadors. 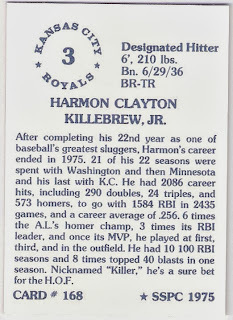 i had the pleasure of meeting killebrew a couple of times, which is to say that i spoke with him at a couple of team sponsored events and signings. 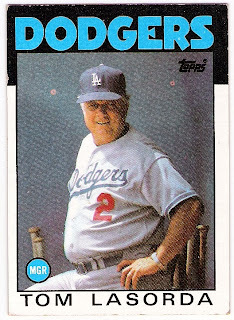 he was revered by twins fans and this dodger fan alike. earlier today we looked at the position players featured in the 1986 topps set who were members of the dodgers in the eyes of topps in 1978. now it's the pitchers' turn. and for good reason even if he weren't the 'dean' of the team. 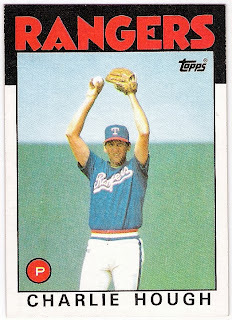 he led the team in wins, era, strikeouts, innings, and complete games in 1985. in 1986, he led the rangers in some of those categories again (wins, era, and complete games), but was overtaken in others (innings, strikeouts) by the guys who hastened burt hooton's retirement - ed correa and bobby witt. still, hough's 17 wins were at that time a career high, and the knuckleballer made the all-star team for the only time in his career. 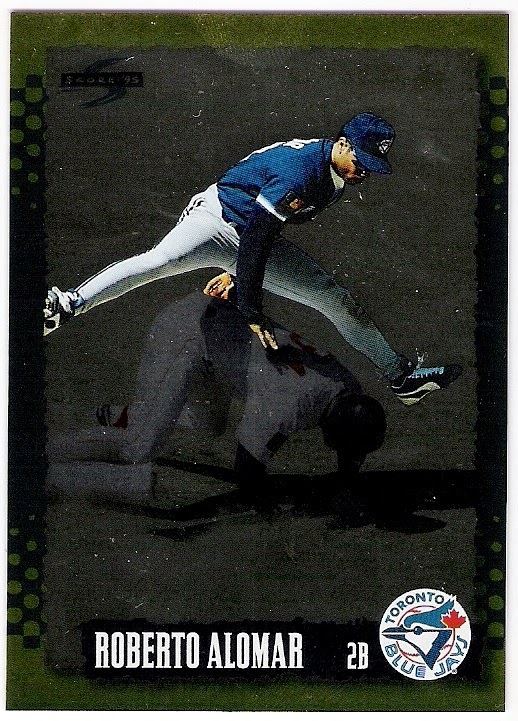 in the midsummer classic, hough pitched a perfect 7th inning to preserve the al's 3-0 lead. 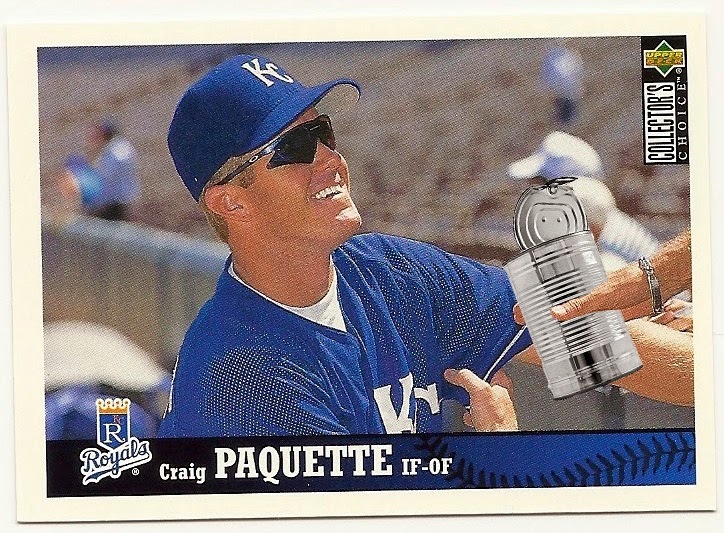 he went back to the mound in the 8th and recorded 3 strikeouts. 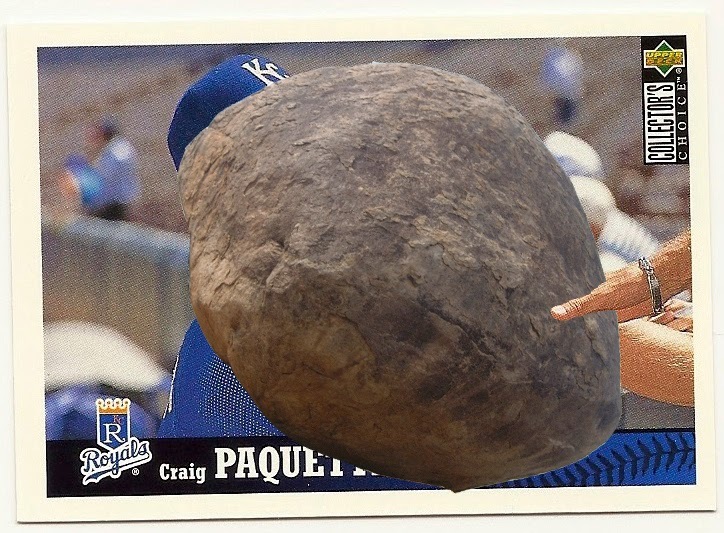 unfortunately, one of his strikeout victims reached on a passed ball. throw in an earlier double and wild pitch, plus an ensuing balk and single, and hough was lifted having pitched an inning and two-thirds while allowing 2 runs (one earned). 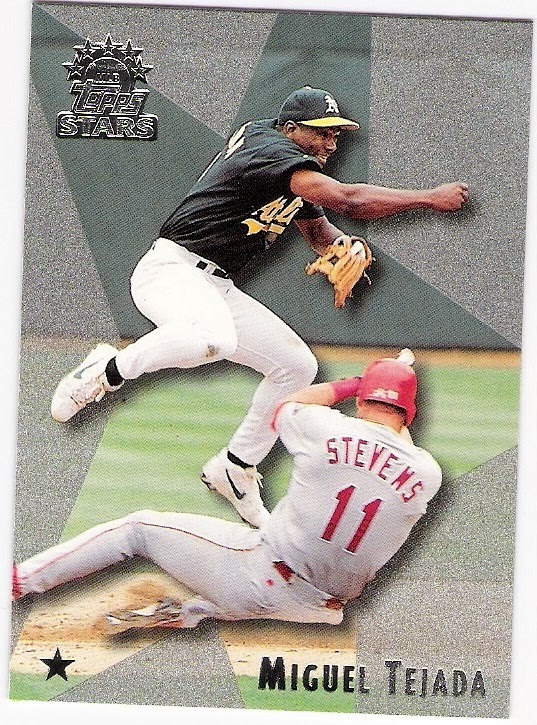 the al still won the game, however. 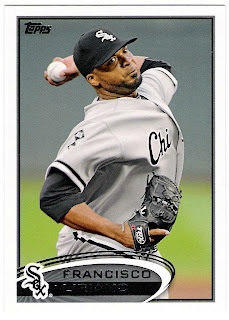 hough's two best pitching performances of the season came against the angels. 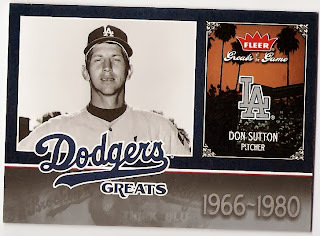 in late september, he faced off against former teammate don sutton, and beat the halos 1-0 on a complete game two hitter. 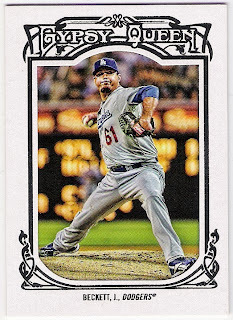 he held the angels hitless in that game through 6 and a third innings. 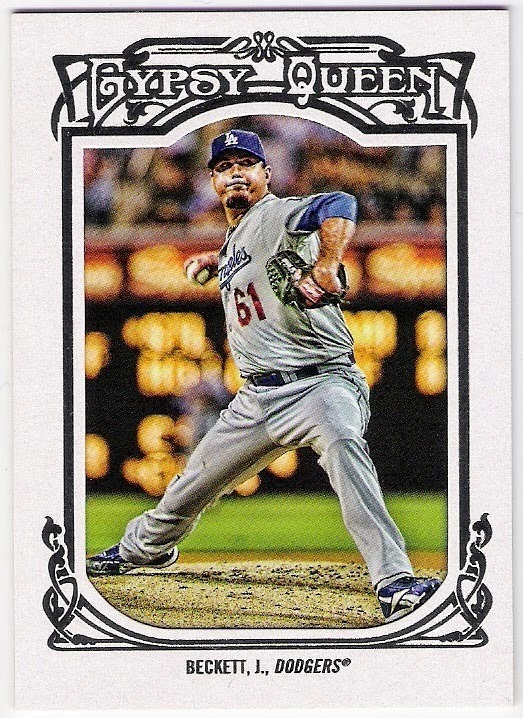 earlier in the season, hough had lost a no-hitter against the angels in the 9th inning. in that game, hough took the no-no into the 9th with a 1-0 lead. 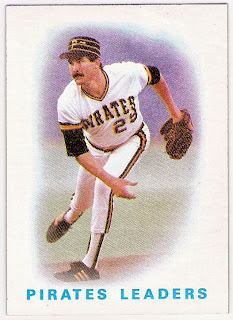 after a strikeout to start the inning, jack howell reached on an error by the left fielder and scored on wally joyner's single, bringing an end to the no-hitter and the shutout. then came a passed ball, another strikeout, and an intentional walk, and then another strikeout that should have ended the inning. 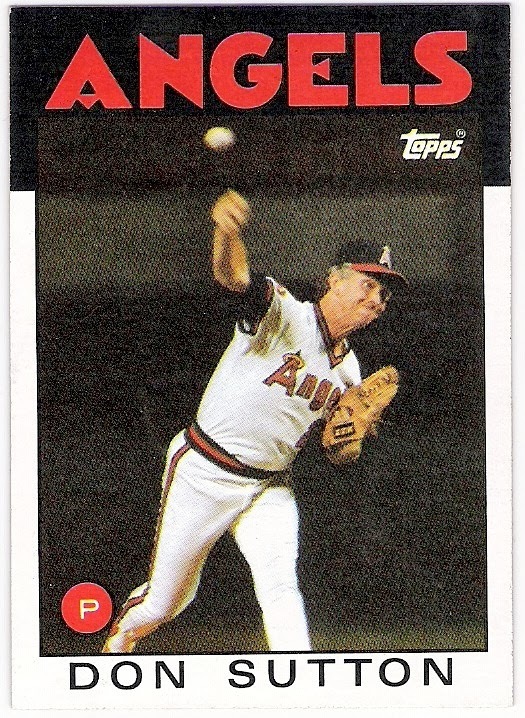 instead, strike 3 came on a passed ball and joyner was able to score all the way from second to give the angels a win and hough a hard luck one-hit loss. 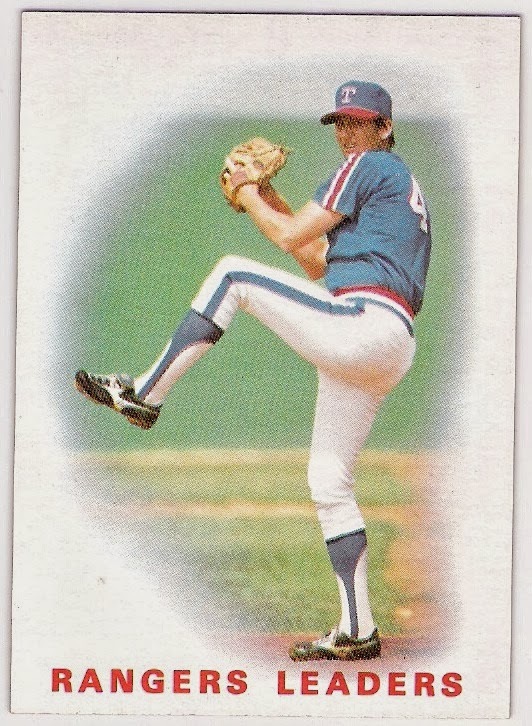 thanks to his service dating back to 1980. rhoden didn't have any close calls with no-hitters, but he did strike out 21 expos over the course of two consecutive starts in late june. 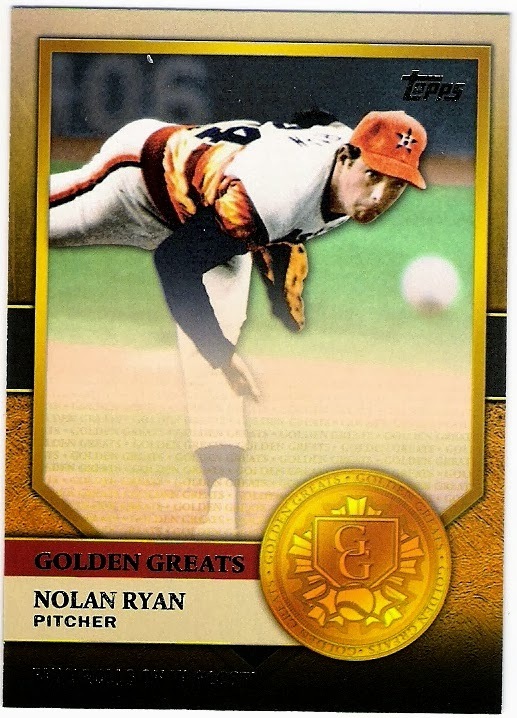 overall, he was a 15 game winner with 12 complete games in 1986. heading into the final month of the season, he was 15-7 with a 2.41 era and a viable cy young award candidate. 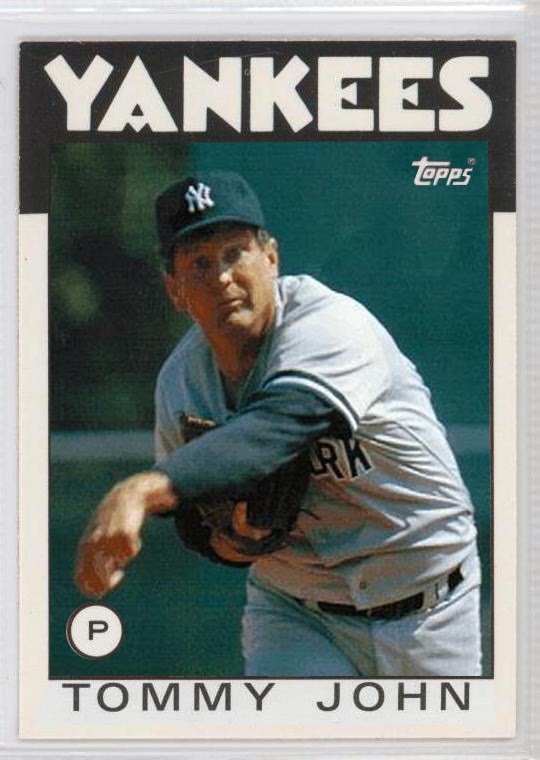 unfortunately, five losses and a no-decision in 6 september starts saw his era jump to 2.84 (still a career best), and rhoden subsequently wound up 5th in the cy young voting. rhoden did win another silver slugger, however, as he hit .278 with a home run (the 9th and final one of his career) and 10 rbi. even though he had returned to the yankees during the offseason. 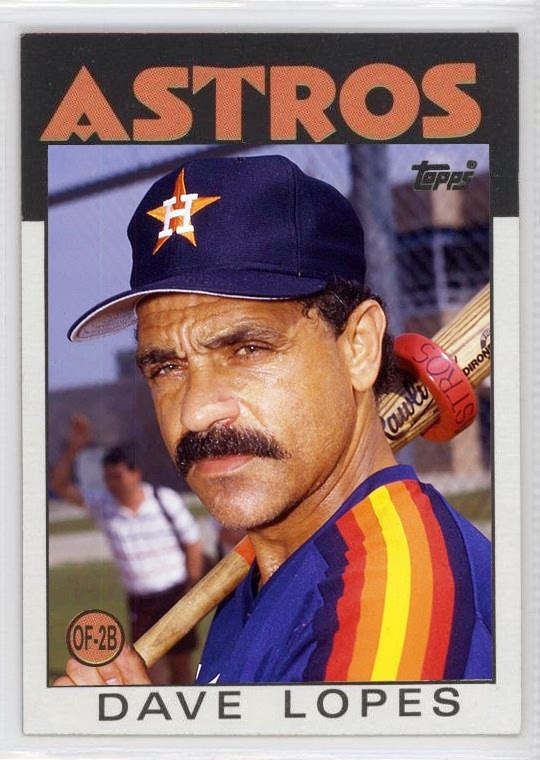 topps chose, as they had with davey lopes, not to include john in the 1986 traded set. i guess john's 13 appearances (10 as a starter) were not enough to warrant a spot in the set. john was 5-3 on the season with a 2.93 era. he pitched in 41 games for the angels, compiling a 4-1 record with 5 saves. 1986 turned out to be forster's last in the big leagues, and although the angels made the postseason, forster did not make an appearance in the alcs. 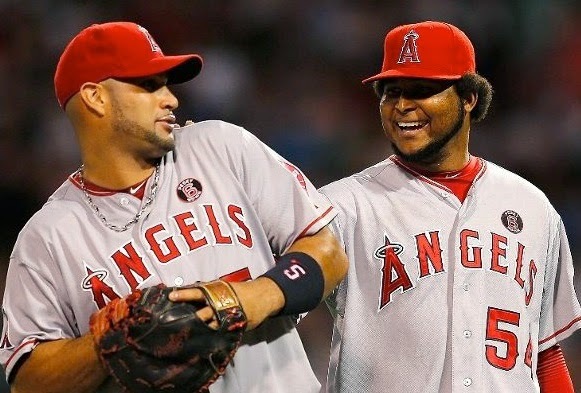 he went 15-11 with a 3.74 era over 34 starts in his first full season for the angels. 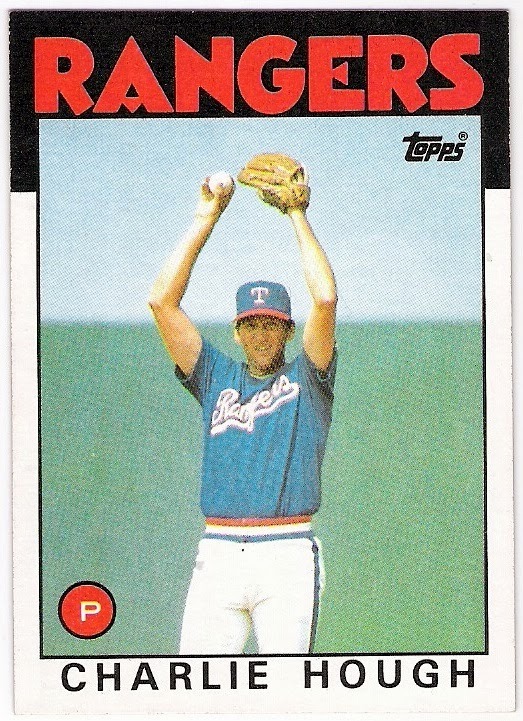 one of those victories, a complete game 3-hitter against the rangers in june (two days after the near charlie hough no-no), counted for the 300th of his career. after helping the angels win the al west, sutton made two appearances in the alcs, including a start. 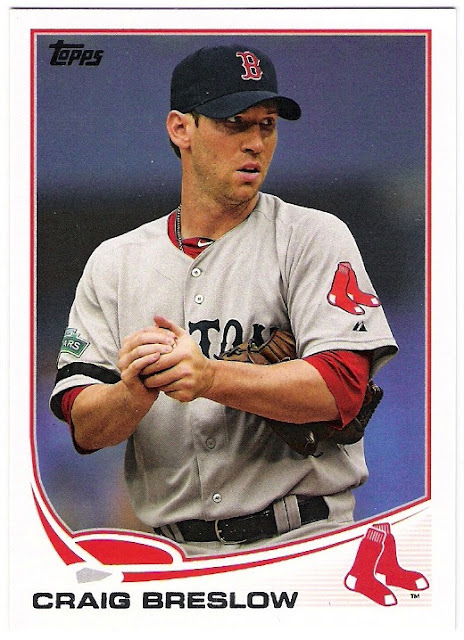 he had an era of 1.86 in those appearances, having allowed 2 earned runs in 9.2 innings of work, but had no record in the series - the last postseason appearance of his career. lasorda hit near bottom in 1986 as far as his managerial career went. 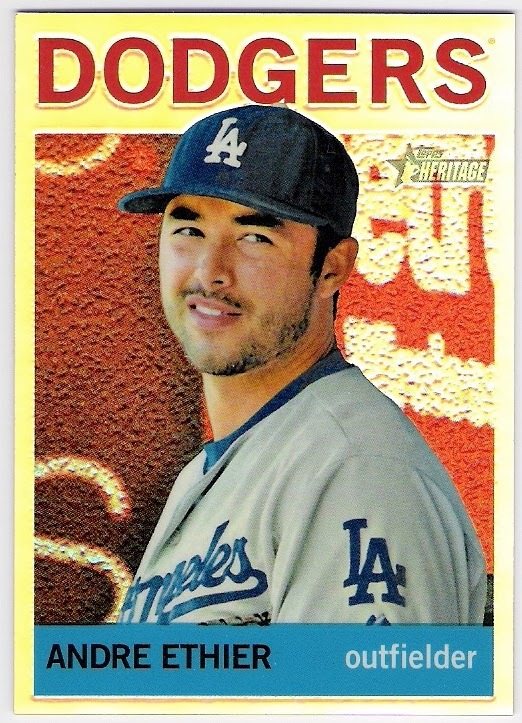 the dodgers posted their worst record to date in his tenure (73-89) and finished 5th in the nl west, 23 games behind the astros. it marked the first time they had ever been as low as 5th place in the division, and they were only a half game ahead of the last place braves! if it were up to him, we'd all be losers! the man's name is a complete sentence!